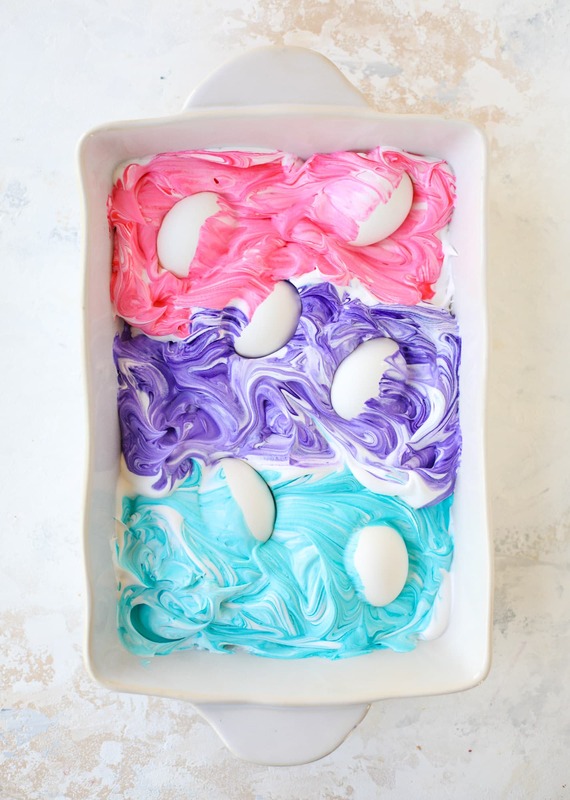 Who else wants to make unicorn eggs for Easter?! If you would have told me back in 1993 that we would start to dye eggs with cool whip, I would have thought you were nuts. A few years ago, lots of people on instagram told me that we could dye eggs using the shaving cream method. 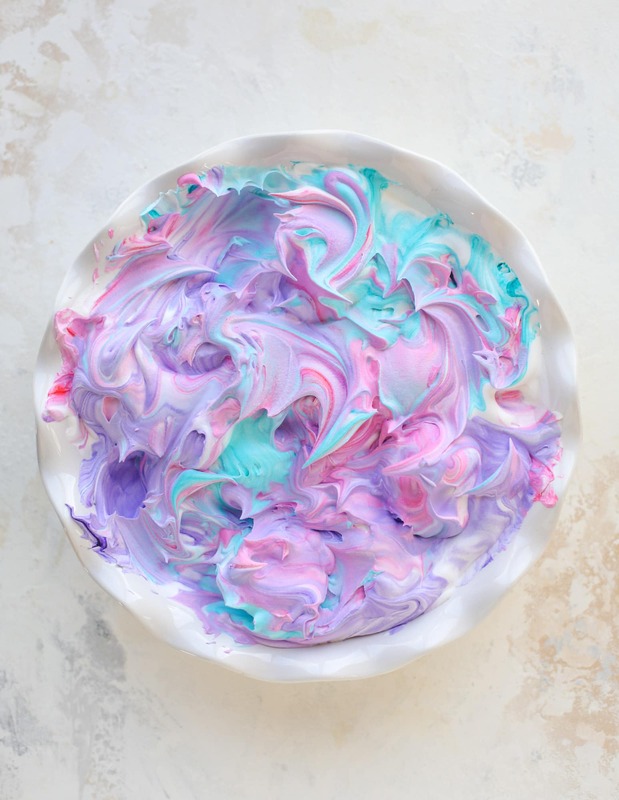 Mix food coloring into shaving cream, place the eggs in the cream for a few minutes and watch them turn pretty colors. Max had recently turned two at the time and I was worried he might accidentally try to eat the shaving cream or something. Enter those big tubs of whipped topping! 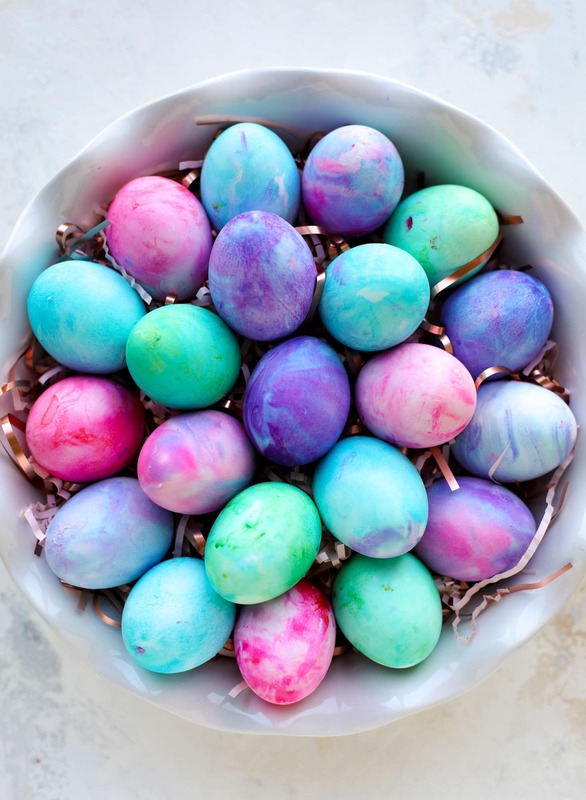 This is such a fun and easy way to dye eggs. I LOVE the colors that come out – so much so that we’ve been using these as decor on our kitchen table! They are just so fun. This is exactly how it goes down… have you tried this?! Put the whipped topping in a dish or bowl. You can even use smaller bowls. You’ll see why I like to use a large dish below! Add in a few drops of food coloring. Be more generous than you would if you were making frosting or something. I’ve successfully used gel food coloring, liquid food coloring and this natural food coloring powder. Gently swirl it around. I like to keep the colors separate at first, then mix them later. Add the hard boiled eggs and fully immerse them in the whipped topping. You can see that sometimes I do one color and other times I do half and half. They never come out perfectly, which is fun – they always look a bit swirled unicorn-esque. Let them sit in the mixture for at least 10 minutes. If you’re doing this for more of a “decor” thing, you can let them sit as long as you’d like! If you plan on eating the hard boiled eggs later, I wouldn’t let them sit much longer than 10 to 15 minutes – and I’d make sure the cool whip is cold. Once you remove the egg from the whipped topping, very gently pat the egg dry with a kitchen towel or paper towel. Make sure they are towels that you don’t mind getting covered in food dye. You hands will also be a bit dyed from this part! Of course you can use other colors (like yellow! red! green! etc), but I just love how the pinks and purples and aquas look together. After we dye a few eggs in the colors we like, I love to swirl the shades together a few times. Don’t over mix, just take a spoon and do a few swirls to mix everything together. Then place more cooked, hard boiled eggs in that mixture too! I mean, I pretty much want to frame this and hang it on my wall. Love the colors so much! This is the end result! These eggs sat for about 30 minutes each and I love how intense the pink and purple turn out. You can also see some spots here on the eggs where I rubbed too hard with the towel and removed some of the coloring. I like to gently pat them dry to remove the topping, then I place them on a clean towel to fully dry. After that, they are totally fine and the color doesn’t transfer! I just love how fun it is to dye eggs with cool whip! We still like to dye eggs the regular old way too (and we will, because it’s totally tradition, especially with my mom! 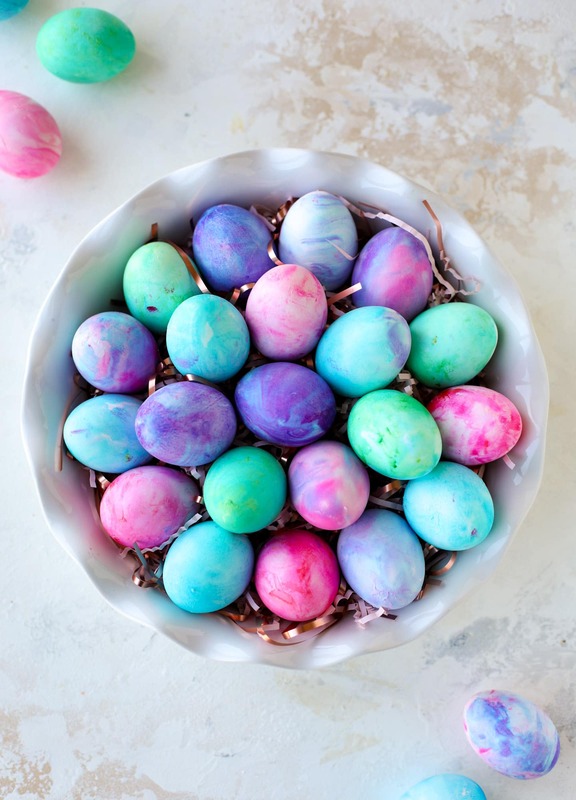 ), but this results in the prettiest eggs ever. Let me know if you try it! These colors are goooorgeous!! Did you use a specific ready-made color or did you mix your own? Can’t wait to try this with my three year-old! These are so pretty! If you wanted to let them sit longer than 10 minutes, you could always put them in the refrigerator. Then you wouldn’t need to worry! Next time I’ll get the white ones! It was fun anyway. The toddler had fun picking colors and coating the eggs in whipped cream.